Super glue can be used for a variety of applications. Whether your gluing small parts or pieces, crafts, models, or plastic components, super glue can be an extremely helpful tool. Below, we will look at some of the best super glues currently available and answer some of the most frequently asked questions about this product. Let’s begin! The best thing about this super glue is its large size and easy to screw on top. Anyone who needs to use a lot of super glue will appreciate the fact that you get a whopping 20-ounces of glue for a low price. It’s all in one container, so you don’t have to worry about using small tubes. It’s professional grade strength as well. This glue is of the highest quality and bond strength. With fast curing and a long shelf life, you’ll get the most out of it. It settles in under a minute so you can get projects finished quickly. It’s also very easy to apply. The long nozzle makes precise application easier than ever. If you are a hobbyist, this is a great option to consider. It’s versatile as well. This super glue can be used for china, plastics, glass, wood, and more. It’s a great glue to have as a household tool. The company also offers users a satisfaction guarantee. There’s a 60-day return policy, so if you don’t like it, you can get your money back. All in all, it’s a great value and works well for most applications. Good formula – This is a professional grade strength super glue. Versatile – You can use this product for wood, glass, china, and more. Large size – This is a large container with plenty of super glue for big projects. Great value – You’ll get a lot for a low price. May dry out – If you do not close the top correctly, this glue will dry out. Verdict: If you are doing a large project and will need a lot of super glue, this is a great option. It’s also good for keeping around the house in case anything breaks. It’s versatile, strong, and a great overall value. Keep in mind that if the lit is not sealed properly, it may dry out. Other than that though, this is a great option to consider if you need lots of super glue. This 12-pack of super glue comes in a handy and easy to store holder that contains all 12 tubes of glue. This is great if you need to keep in stored in a drawer, cabinet, or workbench. It’s the original super glue formula as well, so you can trust that it will work. It can be used on metal, plastic, and other smooth surfaces that would be otherwise impossible to glue together. While it isn’t ideal for porous surfaces, it works great for plastics. It can be used for metal and rubber and bonds instantly, setting in just seconds. We especially like the way that this super glue holds small metal parts together. Some super glues don’t work as well on metallic surfaces. It dries very quickly so you won’t have to wait around for it to set. You also get a lot of glue for the money. You’ll get 12 tubes of glue that each hold about 2 grams of product. Each tube can be closed and re-used. On the downside, the size and way that the tubes are shaped might make it hard to get all of the glue out of each tube. Other than that though, this is a great option for small projects or for household use. Versatile – This glue can be used on aluminum, plastics, ceramics, pottery, and more. Multi-pack – You get 12 tubes of super glue. Storage container – The storage container holds the glue tubes. Good for precise application – It’s easy to apply this super glue. Container is flimsy – The large plastic container that holds the tubes is somewhat flimsy. Tubes are hard to squeeze – The thick material that the individual tubes are made of tends to make them a bit hard to squeeze. Verdict: If you need a good amount of super glue and want to keep it stored in one easy to access place, this is a good option. This is also original formula super glue. It’s been tried and trusted for decades. On the other hand, the large plastic storage container is cheaply made and the material that the tubes are made of is hard to squeeze. Still, if you need to form smooth bonds on plastic surfaces or glue small metal pieces together, this is a great option. It dries fast and you get 12 tubes of super glue for a reasonable price. If you need to use super glue on something but hate dealing with the tiny dried out tubes or stuck-on lids, this is a good option to consider purchasing. Basically, you get four small tubes of very strong super glue for a low price. Each tube has been designed for a single application. When you’re done, you just throw it away. It’s also really easy to squeeze out the glue so you get the most out of each tube. Each tube does come with a lid, so you can keep it from drying out as you use it on your project. Just remember that the glue will dry out overnight after it has initially been opened, even if you put the lid back on. On the bright side, the fast drying formula means that you can get projects done quickly. Essentially, it’s a very fast drying formula. On the downside, if you don’t use all of the glue, you’ll have to throw it away. The formula is also really thin. It’s great for puzzles and crafts, but the bonds aren’t as strong as they would be with other super glue formulas. Still, for tiny parts, small projects, or quick applications, this is a good option. The price is also great. Single application – This glue is great for single applications. Quick drying – This formula dries very quickly. Multi-surface – This glue can be used for small pieces of wood, glass, metal, and will work on some plastics. Dries out – If you don’t use the glue fairly quickly, you’ll have to throw away the remainder as it will dry out. Thin formula – This is a quick drying formula that’s somewhat thin and flakey. Verdict: If you need to glue small parts or thin materials together from time to time, this is a fantastic option. It’s great for anyone who hates dealing with dried out super glue tubes or wasted product. Each tube is designed for a single application. After you’re done, you simply throw the empty tubes away. The formula also dries very quickly. This means less time waiting around and more time getting real results. On the downside, the formula is really thin. This means that you won’t always get the strongest bonds. Still, for lightweight materials and plastics, this stuff is pretty decent. It also comes at a very low price. Gorilla Glue is known for its unique and flexible formulas and ability to create permanent bonds that are essentially impossible to break. This glue has been formulated with micro rubber particles. This means that the bonds you create with this glue are permanent and flexible enough to stand up to pressure. Gorilla Super Glue is extremely versatile as well. You can use it on virtually any material. This glue also comes with an anti-clog cap. Your gue won’t be dried out after a single use. You can use it again and again with great results. Gorilla Super Glue can be used on plastics, wood, metal, rubber, paper, ceramics, and more. This glue is ideal for making instant repairs on projects indoors. It also works well for models and hobbies. On the downside, it may take a couple tries to learn how to use this glue right. Still, once you get the process nailed down, it’s very easy to use. It’s a great go-to adhesive option for household use. The other great thing about this glue is how much you get. You’ll get a fairly large 20-ounce tube of extremely strong super glue for a pretty low price. This is also a great option for survivalists and anyone who needs to make fast repairs when they’re on the go. Strong bonds – Gorilla Super Glue is great for making very strong bonds between materials. Large tube – You get a lot of glue for a good price. No-clog cap – The cap helps prevent clogs so you can use this glue time after time. Reliable – Gorilla Glue is known for its reliability and ease of use. Learning curve – Gorilla Glue takes a little bit of getting used to at first; we recommend doing a test application before you use it on something important. 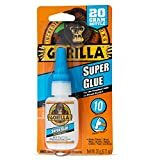 Verdict: If you need a tough and flexible glue with versatile applications, Gorilla Super Glue is a fantastic option for you to consider. With this particular product, you get a lot of glue with a no-clog cap at a good price. It is ideal for anyone who needs to make fast and reliable repairs on-the-go. Even though Gorilla Glue may take a bit of getting used to when you’re first learning o apply it, we feel like it’s one of the best options for strong bonds and trustworthy repair jobs. All around, this is a tough and dependable super glue that comes at a good value. This is a pack of inexpensive tubes of super glue. Essentially, you get 6 tubes of glue that can be used on ceramics, rubber, leather, glass, metal, wood, textiles and most plastics. This glue is totally clear, so you get invisible bonds. You can use this super glue for crafts, repairs, and other applications where regular glue just won’t cut it. This is a somewhat generic option. The super glue is a standard formula that can be used on models or other household crafts. Each tube has a lid and can be re-used in a reasonable timeframe. However, if you don’t use it in a couple of weeks, expect to find a rock-hard tube that you’re going to have to throw away. Still, you get 6 tubes of glue at a low price. The nozzles are also thin enough to use on tiny pieces. This is great for gluing models. If you’re looking for a good cheap super glue option for tiny bonds, this is a good option to go with. Keep in mind that this is not quick drying super glue. It takes a little while to set. Good price – This glue comes at a good price. 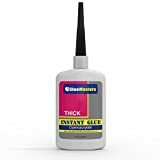 Works well – This glue can be used on many materials and holds well. 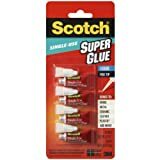 Multiple tubes – You get 6 comparatively large tubes of super glue with this pack. May dry out – This glue will dry out if sealed incorrectly or not used within a few weeks. Dries slow – Compared to some similar super glues, this stuff dries slowly. Verdict: If you need super glue for models or projects, this is a good option. It creates a good strong bond and each tube is comparatively large. The price is also pretty good on this 6-pack. While it dries slower than some other brands, it works well in the long-run. Keep in mind that after you open a tube, you’ll want to use it within a few weeks. All in all, you get a lot of super glue at a good price. The formula is good and the tubes are large. A 3 piece set of super glue tubes, Krazy Glue Super Glue can be used for many different things. You can apply it to materials like plastic, wood, ceramics, glass, and rubber. It’s a great option for people doing crafts or art projects. Each tube contains 2 grams of glue. That’s a pretty good size for the price. Krazy Glue uses a slightly different super glue formula than other brands. This makes it better for wood and not as good on some kinds of plastic. This isn’t necessarily the best option for certain models but works great on puzzles, wood, and ceramics. It’s essentially a popular PVA-based synthetic glue that can be used in many different ways. Also, the lid on this glue is easy to remove. It doesn’t tend to get stuck on like some other super glue tubes might. It’s a lot easier to twist on and off. Good cap – The cap doesn’t stick on as much as with some other super glue tubes. Great for wood – This super glue works really well on wood. 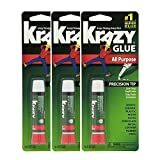 3 Large tubes – You get three 2 gram tubes of Krazy Super Glue. Not for all plastics – This glue doesn’t work well for certain kinds of plastic. Verdict: If you need super glue for art projects or crafts, this is a really good option. Krazy Super Glue works on many materials and the tubes are easy to squeeze. The caps on these tubes also aren’t as prone to sticking. The tubes are fairly large and you get 3 of them. All around, a great option for crafts and art projects but not the best choice for plastic models or repairs. Now that you’ve seen some great options for super glue products, we’ll go over some of the most commonly asked questions about super glue. Keep in mind that not all super glue formulas are the same. In the questions below, we are referring to standardly formulated cyanoacrylate glue (super glue) designated for home use, repairs, hobbies, and crafts. What type of materials can be glued together with super glue? Before you purchase super glue, it’s a good idea to know what it’s actually supposed to be used for. Super glue isn’t a fix-all solution and can’t be used in some situations. Still, super glue can be used on many different materials. It can fix things that other kinds of glue simply won’t help with. This is because super glue is made using a revolutionary cyanoacrylate formula that can bond materials quickly and securely with minimal effort. Here’s a quick list of some of the most popular materials that super glue can be used on. It’s a good idea to understand what super glue can’t be used on as well. Some glues, like Gorilla Super Glue, can be used on materials listed below. However, most standard cyanoacrylate glues can’t be used easily on these materials. How does it compare to a hot glue gun? If you’re doing crafts, art projects, or certain kinds of repairs, you may be wondering if you should use super glue or a hot glue gun. This is understandable. Both kinds of glue are great for bonding materials that would otherwise be impossible to stick together. In general, super glue is a great option for smooth surfaces and hot glue guns are better for rough surfaces. Super glue is almost never a good option for fabrics. The tiny fibers in fabric don’t stick well and can’t be held easily with super glue. Hot glue guns work amazingly for fabric materials because they actually melt materials together. That being said, hot glue guns are not a good option for sticking plastics and metals together. Plastic beads, for example, are not going to stick for long if they are glued with a hot glue gun. Here’s a quick summary of how these glues compare. Super glue is the best option for bonding most plastic materials together. Super glue works amazingly on metallic surfaces, especially aluminum. Porous materials like leather and ceramics are best held together with super glue. Super glue is not a good option for synthetic fabrics, felt, or other fibrous and malleable fabrics. Most super glue will dry in under one minute. Super glue is very easy to use. You just take off the lid and squeeze it carefully wherever you need it to be applied. Hot glue guns can sometimes be used on plastic, but it doesn’t work as well as super glue. Hot glue guns aren’t a good option for most metallic surfaces. Sometimes, hot glue works on porous surfaces like wood and natural materials. For leather and china, you may be better off with super glue. Super glue is the best option for bonding fabric together. Hot glue guns work quickly once they are warmed up but they take a while to warm and melt when you turn them on. Hot glue guns require glue sticks, an electrical outlet or batteries, and usually some amount of previous knowledge and experience to use. What is super glue made of? You may be wondering what exactly super glue is made of and why it works. Super glue actually works on a molecular level by forming bonds caused by water. It’s a kind of resin that has been a revolutionary tool since its synthetic creation in 1942 by Goodrich Company. Super glue formulas may vary, but in general, super glue is made of a revolutionary acrylic resin. this resin is called cyanoacrylate. It creates an almost instantaneous bond between various materials. The molecules in cyanoacrylate acrylic resin react on contact with the hydroxyl ions found in water. Trace water is all around us. You can find microscopic amounts of water in the air and on most materials. As soon as super glue is exposed to these tiny particles, it immediately begins forming a bond. Some formulas of super glue use rubber. This helps to create a strong and flexible bond, though it may take a little bit longer to dry. Once the cyanoacrylate molecules begin to link together and form chains, a bond begins. The molecules spin around in tiny little strands that can only be seen under a microscope. This creates a kind of a mesh effect. When the glue thickens and hardens, the tiny molecular bonds are permanent and immobile. We hope you have enjoyed reading this buying guide! We want to know what your thoughts are. What super glue brands do you prefer? What do you use super glue for in your household? Did we forget to answer any of your questions? We are interested in your opinion so please feel free to leave us your comments and let us know what you think. Thank you for reading and happy crafting!